This entry was posted on April 19, 2016 by Jessica Anderson. With the conclusion of spring break, we're on the home stretch of the school year. Next up in May is Teacher Appreciation Week, where parents and students celebrate the educators, administrators and staff at their local schools. Usually planned by volunteers, activities for the week include themed events with small gifts, catered luncheons, decorations, and pampering! My kids' elementary school always had teachers' doors decorated and themes for each day of the week, with luncheons, massages, and coffee for the staff. 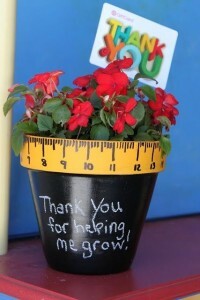 Check out great ideas for teacher appreciation at our pinterest page! If you are a room parent, PTA volunteer, or student, brainstorming ideas and then implementing a week's worth of appreciation for the entire staff at your school can be daunting. Here are some ideas to help with planning an awesome week for outstanding teachers. Small Gifts: for small inexpensive gifts, use Pinterest as your inspiration. Check out our Teacher Appreciation Board for cute, inexpensive and easy ideas. Large Gifts: If you would like to treat your teacher to a larger item for their classroom or a gift card to their favorite store, consider pooling your class money into one larger gift. As a past room mom, I can tell you that this is a hit with teachers - they love it! Apple Teacher Awards: We offer a number of different "apple" awards that teachers would be proud to display. Popular options include our 3D Apple Teacher Appreciation Plaque, Engraved Crystal Apple, and Red Apple Resin Award. Kid-Made Items: Cards or letters made by students will touch teacher's hearts and will be cherished for years to come. Consider having the students write letters or draw pictures and put them in a binder for the teacher. Ms. Inama from Enatai Elementary was last week's 'Teacher of the Week". Award your Teacher: Nominate your teacher for an award to showcase their talents. Most schools offer Golden Acorn Awards that honor Outstanding Educators. 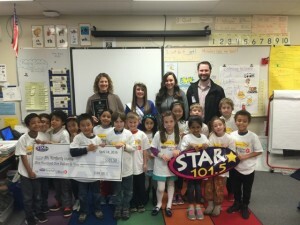 Community organizations also honor teachers; here in the Seattle area, we sponsor the STAR 101.5 "Teacher of the Week" contest. Each winning teacher gets a check for their classroom, gifts and an engraved plaque made by Trophies2Go! Volunteer your time: Teachers appreciate the helping hands of parents and other volunteers. Get involved at your school to see how you can help. Be sure to participate in the 2016 Teacher Appreciation Week May 2-6! Teachers, administrators and school staff deserve recognition and thanks for educating our youth! Find out more at the National Education Association.